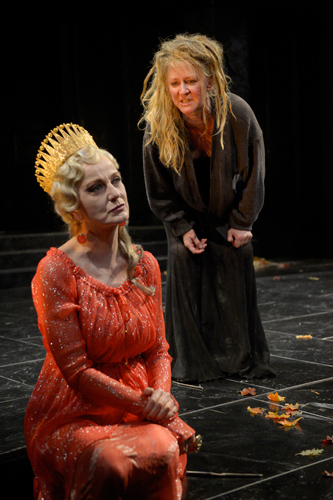 Caroline Lagerfelt as Clytemnestra and René Augesen as Elektra in Sophocles’ Elektra. Photo by Kevin Berne. To ACT this evening, to see Elektra, featuring Olympia Dukakis. Or, at least, it features her on other nights. We got the understudy, Omozé Idehenre. We hated the play, but it wasn’t all her fault. It’s pretty rare that you see a 90 minute, no-intermission play and think it’s too long, but we did tonight. The prevailing opinion seemed to be “get on with it already”, as Elektra whines and mopes about her dead father, over and over and over and over. She’s pretty ticked off at her mom, too, but that may be understandable because mom is the one who killed dad. If only her brother, Orestes, would come back and save her! But alas, some men come and explain that Orestes is dead, killed in a chariot race. A race described in interminably excruciating detail. Oh Woe! But then a man comes with the urn containing his ashes, and there is more woe. Except that he turns out to be Orestes himself, who his doting sister doesn’t recognize. This is a plot Shakespeare would have discarded as being too silly. Mom gets killed. Dad gets killed The end. Thank God it’s over. I usually like Carly Perloff as a director, but it seemed like everyone was just screaming their lines so we would know they were important. Sort of like acting, but takes less talent. Ms. Dukakis was supposed to play the role of the Greek Chorus; perhaps she would have been able to sell the story better than Ms. Idenhenre. I’ll never know. Or care. This is a night of theater best forgotten.